Lately when Gary isn't asking for pancakes, he's heating up a few frozen waffles for breakfast. His latest addiction is quinoa waffles. He loves the nutrients and protein it gives him, and it gives him more energy for whatever he needs to do. I haven't found a quinoa waffle recipe yet, but if you have one let me know. I did decide to make this multigrain version to try out as an experiment. You see, I "borrowed" my sister's waffle maker a while back, and I don't plan on returning it anytime soon :). These came out great, and I liked the wholesome nutty taste the oatmeal added. Overall, this recipe is a keeper as a basic waffle that will fill you up all morning. This was an easy recipe to whip up in the morning. My 15 yr old waffle maker heated each batch up in about 7 minutes. Preheat waffle maker according to your manufacturer's directions. In a large bowl whisk together all the dry ingredients (flour through sugar). In a mixing cup, add the oil to the soy milk. Whisk the milk into the dry ingredients. Mix until just combined, and most lumps are gone. Spray or brush the waffle maker with oil. 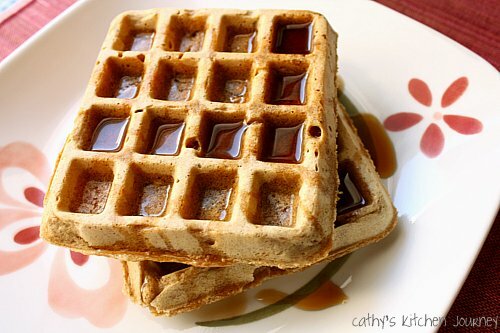 Pour enough batter into waffle maker and cook per the waffle maker's instructions. Mine took about 7 minutes each batch of 2 waffles. Repeat until batter is used up, spraying/brushing more oil as necessary. *store leftovers in a freezer bag and reheat in toaster for a quick morning breakfast! I'm always looking for vegan recipes to try...these look great! And I love the flax in there!